15 Red & Yellow Roses bouquet (2no) specially made to send your wishes to the couple on their most special day.We specialize in making a large variety of flower baskets and bouquets. While most of our flower baskets and bouquets can be sent as gifts on any occasion, some of our floral arrangements are for specific occasions only. Our Best Wishes is one of such arrangements. 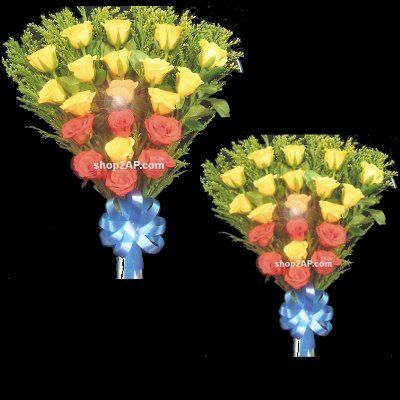 Best Wishes comprises of a pair of Red and Yellow Roses identical bouquets. Our florist has attractively arranged 15 Yellow Roses and Red Roses along with fillers. Send roses bouquet online to wish the happy couple warm wishes. The Best Wishes Bouquets can be sent on wedding day or anniversary. We have home delivery service and same day delivery service.Same Day Home Delivery & Midnight Delivery Available.